More than 80 years after NIU first opened as the Northern Illinois State Normal School in 1899, faculty in Physical Education began to embrace a new way of thinking. “Our Department of Kinesiology and Physical Education (KNPE), and our peers across the country have their origins as Physical Education (PE) departments. All students would have been PE majors with traditional PE classes, such as gymnastics, dance and sports skills,” Chair Chad McEvoy says. NIU’s evolution began before the University of Tetova (UT) existed. 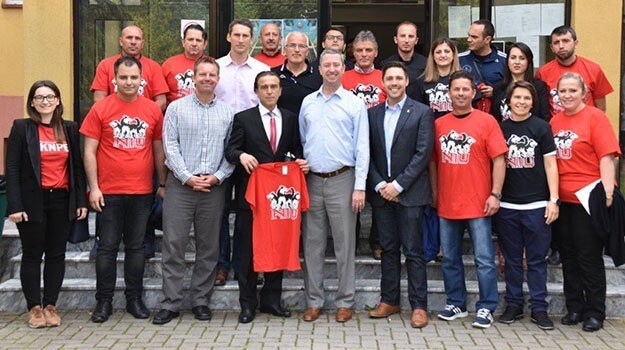 But less than a quarter-century later, McEvoy says, the young and only Albanian school in Macedonia has “a finger on the fast-forward button” – and conversations have begun about what a dual-degree program would look like. Case in point: McEvoy, along with KNPE faculty members Clayton Camic, Steven Howell and Jim Ressler, traveled to Tetova in May to participate in an international workshop on sport sciences. Discussions, keynote remarks and Q & A sessions covered possible collaborations on academic conferences and workshops, along with joint research on Adapted Physical Education programs, as well as the importance of PE in school. Scholars from both institutions talked about graduate studies in PE, research methodology, exchange programs and the professor-student relationship. NIU’s contingent also enjoyed a tour of Tetova’s performance lab, biomedical lab, game analysis lab, fitness center and sports grounds. It’s the latest step in a growing and flourishing partnership, one that McEvoy believes is helping Tetova reach its aspirations. The Center for Peace and Transcultural Communication, a joint venture between the two universities, has hosted two global conferences. NIU Acting President Lisa Freeman and UT Rector Vullnet Ameti have each been awarded an honorary degree from the other institution. Meanwhile, the College of Education’s Blackwell History of Education Museum hosted a photographic exhibition of Tetova’s history. Ameti, who helped to found UT, and others from Tetova attended the opening ceremony in December. “Rector Ameti, having a background in sports – he was a national team wrestler back in the day – wanted sports and Physical Education to be part of our partnership, and we’ve been happy to be a part of that,” McEvoy says. “We shared ideas about the American model of education,” he says. “Their style is very formal: giving a lecture, a PowerPoint, very one-directional, a traditional model of straight lecturing, note-taking, one-way conversation. The American model has evolved to much more of a two-way, or a multi-way, conversation in our classrooms. We’re leading a discussion,” he adds. KNPE, on the other hand, is able to expand its international work while gaining a close-up glimpse at what sport, kinesiology and PE look like in a different culture on the other side of the world.